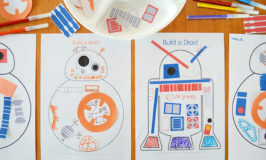 On days when it is just Noah and I we go back to basics – simple art activities that are perfect for small hands that just want to put paint on paper and see what happens. 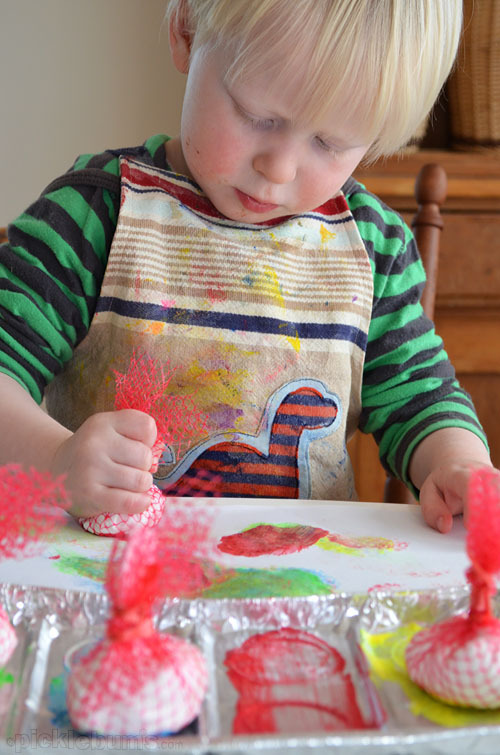 This mornings we experimented with mesh dabber painting, and it was just that – easy and fun. A plastic mesh bag – we got ours from a bag of oranges. String or elastic bands to tie up your dabbers. A container for the paint – we used a foil tray from the recycling. Paint – we used a selection of paints given to us by Micador. Nice big sheets of paper. To make the dabbers I cut our orange bag mesh into four square-ish pieces, then scrunched up some newspaper into small balls and put a few layers of tissue over the top. Wrapping the balls in the mesh I tied it all at the top to make a nice squish dabber for the paint with a nifty handle at the top. You could use plain fabric for the outside of the dabbers too, though the mesh makes an interesting printed texture. Then following the ‘keep it simple’ ideal, all you do is swish the dabbers around in the paint a bit and then start dabbing! 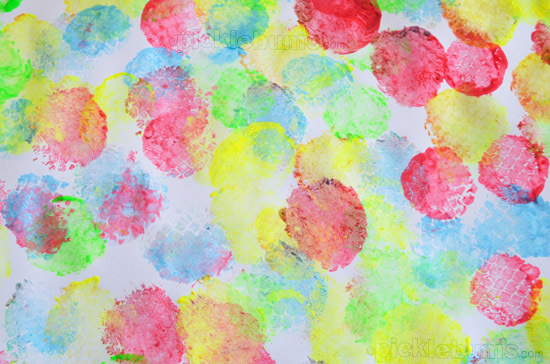 This activity is perfect for toddlers as it is easy to get paint on to the paper without too many drips, but I am sure my big kids will want to have go too when they get home from school. Noah used lots of large arm movements and big wild dabbing to make a range of printed, textured circles across his paper. 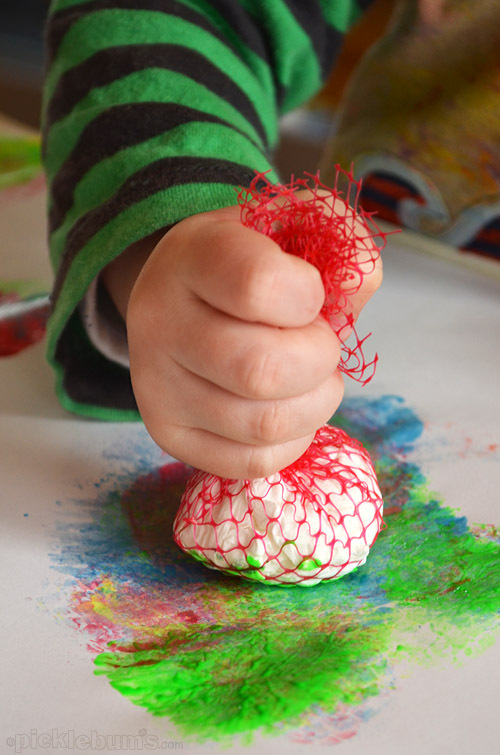 Later he experimented with swishing and rubbing, mixing colours and just having loads of fun. The hardest thing about this art activity was deciding on what colour paints to use! What’s your favourite colour combo for painting? My little one would love this. We’ll have to try it. I always limit my children to 3 colour choices.. Is that bad? Everything just turns into a big brown mess otherwise. Does it make me seem better or worse if I admit that I limit my own colour palette too when I paint? What a brilliant idea! I love how simple it is and a great use of those orange bags you usually would throw away. Paint colours are spectacular too! My Prep/Year 1 class love this painting experience. I love it as it’s so easy to set up! 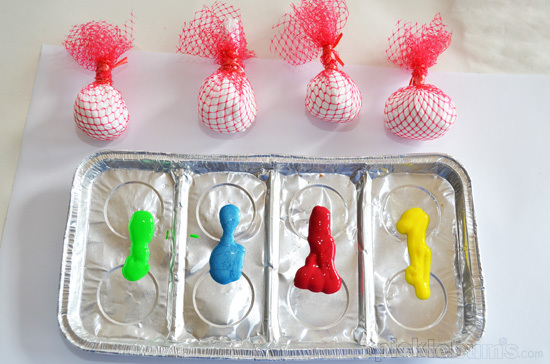 I love the colour-mixing that comes out of this activity. 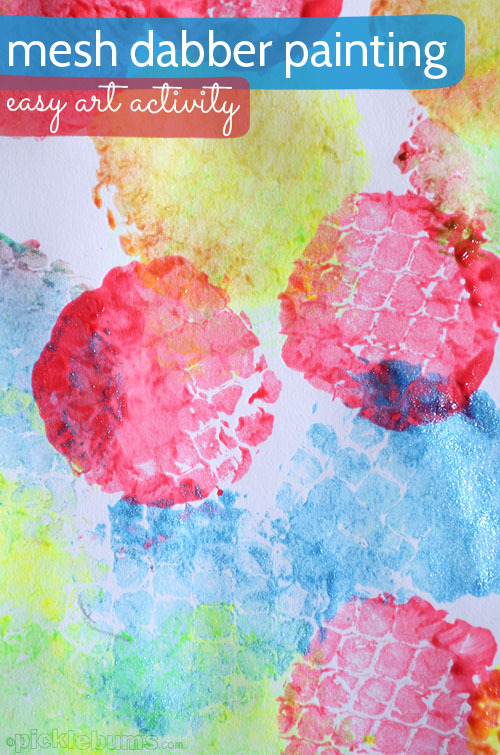 This is my all time favourite toddler painting activity…although your colours are much nicer than i ever use hehe! 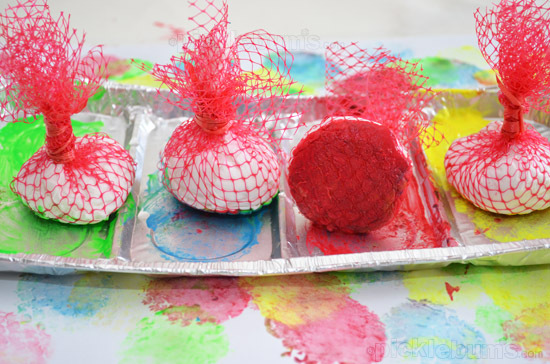 I like your idea of the paper balls and tissue…i have always just used sponges cut up. They last forever too…i still have some from when my teen used to play with them! Love his cute little face concentrating so hard!! I love this idea! We will definitely be trying this very soon. My girls will love this. Thanks for sharing! Love this idea! I like the texture that it gives. For colors I always use two of the primary colors (and I use cyan, magenta and yellow instead of basic red and blue) and then white. This prevents the brown mess that can happen plus it helps them start to see how colors are made. I never give black because it is too strong. I find it hard not to use either purple or blue. I made myself only give the kids red and yellow the other day and I do try to mix it up with colour combinations to give them different colour mixing options.. but yes, love blue and purple paint! 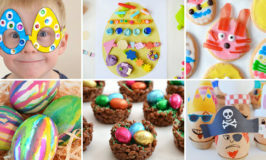 This looks like a lot of fun and I think my Noah will want to have a go too!